UPDATING....... Move over Wonder Woman. 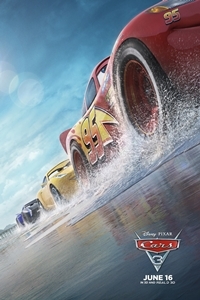 Pixar has "Cars 3" racing this weekend. 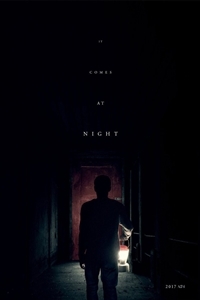 The week also will see the debut of the horror flick, "It Comes at Night." This one has the potential for a 'sleeper' if enough fans discover it. That's good for #4 below Captain Underpants and above Dead Men Tell No Tales. This one has great reviews as a contribution to the pandemic genre including "blood curdling tension out of controlled camera movements, creative practical lighting and a red door." After two families survive the apocalypse, this "screw with your head" script . plays on cultural anxieties, is impossibly tense, effective, slow boiling and unsettling. Kate Mara, the female lead as the composite cheerleader (Annie) in "We Are Marshall" , stars as a Marine Corporal working with her military combat dog, Rex. For this based on truth, personal journey, Mara (according to the Chicago Sun Times) turns in "one of the best performances of her career." 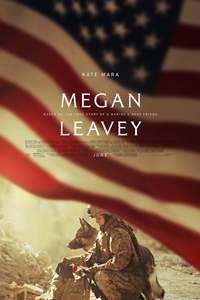 Another suggest that by adding a dog, "Megan" becomes the most emotional of Iraq War combat films, which celebrates soldier canine comrades. 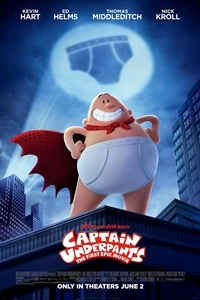 Since there has not been an animated film since April, Captain Underpants likely will woo families and young children. 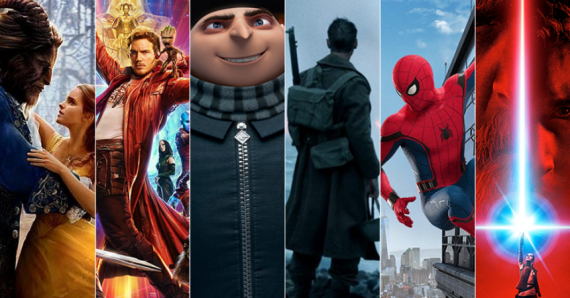 It's following the same buzz path as Boss Baby, but it has two well recognized sequels headed into theaters later in June --- Despicable Me 3 and Cars 3. Described as "fresh, funny and frantic" the charming, ingenious and absurd tale of friendship has gained acceptance for appealing immaturity. Tom Russo in the Boston Globe wrote, "it's healthy, even vital, to laugh at scatological silliness, adults included." 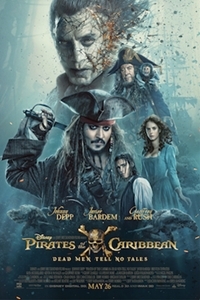 Johnny Depp's swashbuckling nonsense and soggy mythology "Pirates,...Dead Men..." will hold on to third place in the weekly popularity derby. Viewers have tended toward "mixed" reactions. Fans of the franchise rank it one of the best; others define it as having too many plot holes and contradictions. By the way, the film version of the TV series dominated by Pamela Anderson has been branded as a wash out, but a mid-range would be more fair. Filled with soapy charms the R-rated surf party contains a flurry of genitalia jokes and F-bombs, hulking , dim-witted Dwayne Johnson and hazy one liner king Zac (Neighbors) Efron boost the film. However, it's also labeled "second rate," "a meandering misdemeanor" and "equal opportunity" stupid. 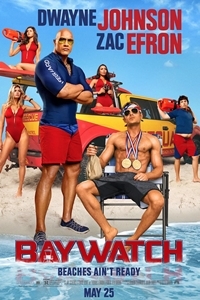 Depending upon your own funny bone, it seems "Baywatch" is a matter of personal taste -- you have to determine whether it's a decent wave or only quicksand. Catch the newly release Blade Runner 2049 official trailer above. FOR TWITTER, the top 10 for Thursday, June 8, does not include a total tally, just daily numbers. Flashback Cinema: Ferris Bueller's Day Off (June 11 & 14); Raiders of the Lost Ark (June 18 & 21); Blues Brothers (June 25 & 28); Jaws (July 2 & 5); Sandlot (July 9 & 12). Sisters Kate and Lisa are ready for the holiday of a lifetime in Mexico. When the opportunity to go cage diving to view Great White sharks presents itself, Kate jumps at the chance while Lisa takes some convincing. Lisa finally agrees and the girls soon find themselves two hours off the coast and about to come face-to-face with nature's fiercest predator. But what should have been the trip to end all trips soon becomes a living nightmare when the cage breaks free from the boat and plummets to the ocean floor. Kate and Lisa find themselves trapped deep underwater with less than an hour of oxygen left in their tanks. 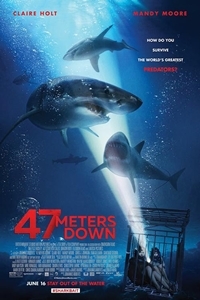 They must somehow work out how to get back to the safety of the boat above through 47 meters of shark-infested waters. 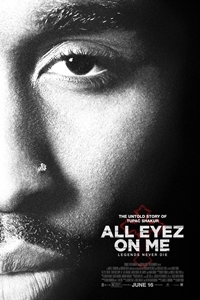 All Eyez On Me" tells the true and untold story of prolific rapper, actor, poet and activist Tupac Shakur. The film follows Shakur from his early days in New York City to his evolution into being one of the world's most recognized and influential voices before his untimely death at the age of 25. Against all odds, Shakur's raw talent, powerful lyrics and revolutionary mind-set propelled him into becoming a cultural icon whose legacy continues to grow long after his passing. Secure within a desolate home with his vigilant, protective and heavily armed parents, 17-year-old Travis navigates fear, grief and paranoia amid scarce resources as a desperate young couple seeks refuge in his family home with their young child.Despite the best intentions of both families, paranoia and mistrust boil over as the horrors outside creep ever-closer, awakening something hidden and monstrous within him as he learns that the protection of his family comes at the cost of his soul. Maddy is desperate to experience the much more stimulating outside world, and the promise of her first romance. 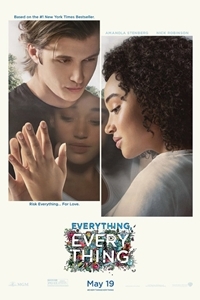 Gazing through windows and talking only through texts, she and Olly form a deep bond that leads them to risk everything to be together - even if it means losing everything. Beauty and the Beast continues strong in hold over family friendly business. The sing-a-long did not take off. 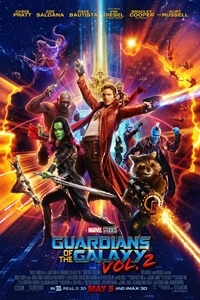 Most 3D showings have ceased. So, it's time to catch it one more time on the big screen with digital sight and sound. 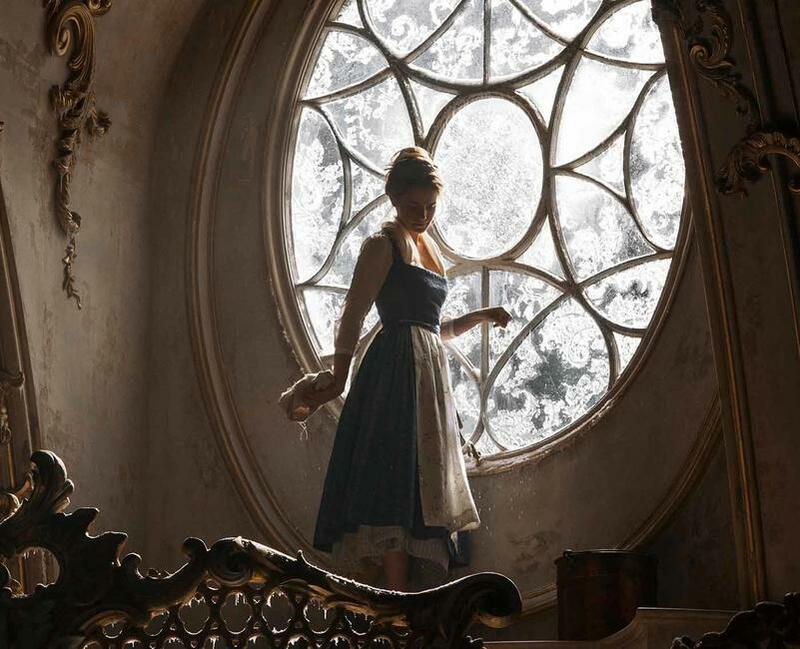 BEAUTY AND THE BEAST: The fantastic journey of Belle, a bright, beautiful and independent young woman who is taken prisoner by a beast in his castle. Despite her fears, she befriends the castle's enchanted staff and learns to look beyond the Beast's hideous exterior and realize the kind heart and soul of the true Prince within. FLASHBACK: Sunday June 18 and Wed June 21. 330 & 7 p.m. "Raiders of the Lost Ark." 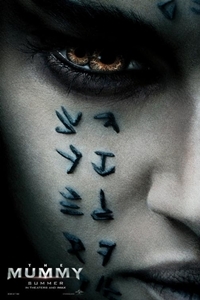 Flashback: Sun/Wed June 18 and June 21 , Raiders of the Lost Ark 3:30 & 7 p.m.